← Deep in the Game Helps out the Head Cases! The Discraft Drone has a menacing robotic insect graphic on the Pro-D version. It also has the “+2.5” stability rating- officially making it very over stable. So is that it? Is the Drone’s bark as big as it’s bite? In short: nah. 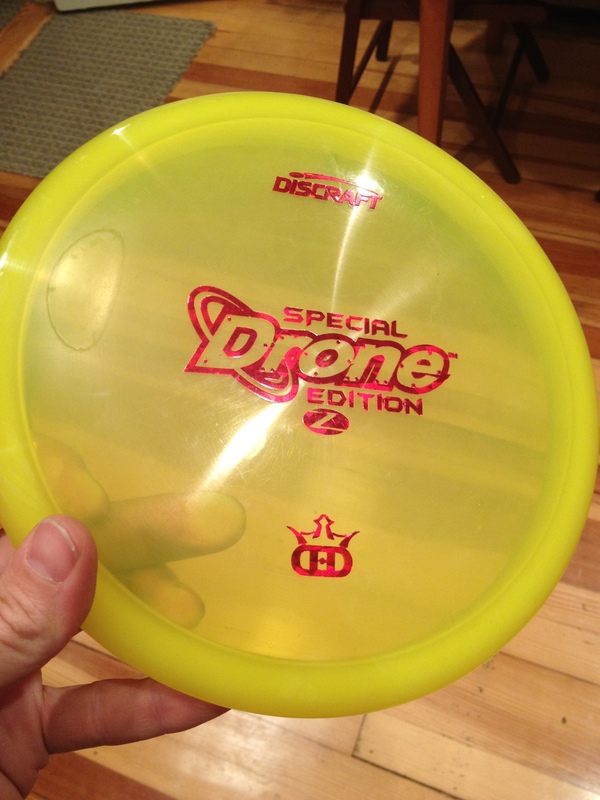 The Drone is an over-stable midrange disc, and while it’s very reliable and over-stable; I for one, don’t consider it to be a “meat-hook.” It may have something to do with the speed, or perhaps it’s something else with the shape, but the Drone CAN be turned over (especially on aggressive flick approaches) and can be pumped right down a straight fairway with a confident backhand. There is a very reliable fade at the end of every flight the Drone takes, but depending on the user and the power of the throw the Drone is a versatile disc. All of this introduction probably speaks more to my approach to the Drone- I assumed it was a meat-hook and I didn’t have a use for it. However, once I gave it an honest shot I realized the Drone is super reliable and very useful. On one of my first throws, I flicked the Drone sidearm- thinking I’d get the over-stable flight path that everyone talks about. However, my out of the box Z-Drone took the shape of an S curve and actually turned over for a bit. Immediately I discovered that the stability threshold of the Drone was within striking distance, and this made the disc so much more useful than I can explain. If I stick to backhand throws, flipping the disc won’t be an issue. At the same time if I only threw it backhand from the beginning, I may not have been confident enough to dial it down on the “spaz-ometer” when I throw it. In other words, I probably would have been putting 100% power into every Drone throw because I would’ve been concerned with letting it get away from me. It’s a great disc. The rim is huge and chunky for a midrange, which makes it easier to grip for forehand throws and, depending on personal preference, can make it easier for backhands as well. It handles the wind like a champ. After putting a Drone in my bag, I’ve boiled down the majority of my approaches to either a Zone or a Drone. I’m confident in throwing both of these discs on any angle from either backhand or forehand with a lot of power knowing that it won’t do anything unpredictable, and knowing that it will hyzer or fade back a consistent amount. This entry was posted in Equipment and Gear and tagged disc, discraft, drone, golf, review, z. Bookmark the permalink.